Our goal for this first year was to make state government more productive and service-oriented. In the coming years, our priorities will include more funds for our schools as well as housing and homelessness, workforce development, improved social and health services, and advancing the state’s economy through innovation and global initiatives. We’ll keep working toward a clean energy future while we protect these islands we call home. Top image: Gov. 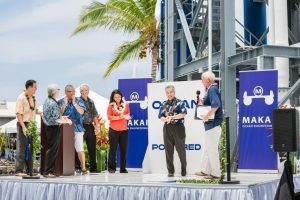 Ige joins Congresswoman Tulsi Gabbard and county officials in “flipping the switch” at the Ocean Thermal Energy Conversion plant blessing in Kona.